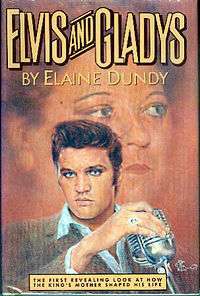 Elvis and Gladys (ISBN 1-57806-634-4) is a biography of rock and roll singer Elvis Presley by author and film industry insider, Elaine Dundy. The book recounts Presley's early life, the role his mother Gladys played in his formative years, and his beginnings in recorded music and film. Hardcover edition published in the United States in 1985 by MacMillan Publishing Company, New York. ISBN 0-02-553910-8. It was reissued in paperback in 2004 by the University Press of Mississippi. Widely acclaimed, the Boston Globe called it "Nothing less than the best Elvis book yet" and Kirkus Reviews, "The most fine-grained Elvis bio ever." The biopic which depicted Elvis' relationship with Gladys is featured in the TV series Elvis (2005), which starred Jonathan Rhys Meyers as Elvis and Camryn Manheim as Gladys.